Explorez les principales attractions de Xi'an lors d'une visite guidée de deux jours en train rapide de Pékin. Après une prise en charge à l'hôtel, visitez Bell et Drum Tower Square, les remparts de la ville, Muslim Street et le musée des guerriers et des chevaux en terre cuite. Apprenez l'histoire de l'ancienne capitale de la Chine grâce à votre guide anglophone et profitez de deux délicieux repas et hébergement à l'hôtel compris dans ce forfait combiné sans tracas. My praise for this tour began before I even left the US. 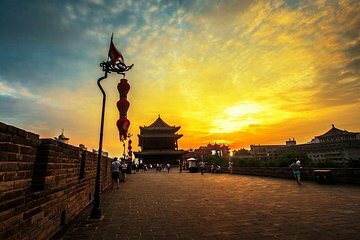 I contacted China Tours through WeChat and was connected with Lenna. She was informative about this trip and was gracious enough to answer my general questions about travel in China. This trip requires you to be in your lobby the morning of the first day where a driver takes you to the train station and you board train with tickets sent to your hotel several days in advance. The tour guide meets you in the train station and takes you to driver and car. We had them stop for lunch after the 6 hr train ride which was no problem. Then you have 4 hour tour of the city wall and Muslim quarter. You are taken to 4 star hotel and we had a room on 20th floor looking out onto the city wall that is lit up at night-beautiful. Breakfast brunch included and then off to see the terra-cotta army. Awe inspiring site. Lots of information provided by guide and then off to another 5 star hotel and lunch. Note: this was a bit rushed as we had a train to catch by 2:38. Guide took us to station entrance and a driver was waiting for us when we got back to Beijing. Well worth the cost! This amazing trip was a perfect get away from Beijing. Our tour Guide, Lucia, was amazing. Without Lucia the trip would have been very good but with her expertise the trip was fantastic. She made my grandson and I feel right at home in this new city. I would highly recommend this excursion. If you can get Lucia as your guide that would be a plus.